Happy Saturday and good morning to you, the reason for my lack of posts the past week is simply organising and cleaning. I have been separating, donating and reorganising like crazy. I have really put pressure on myself to get the whole place sorted before the new year, I need to chill. Anyway, today I am showing you how I store my earrings. I have so many earrings, many of which I have purged. I can't truly appreciate them unless they are stored properly. I have used various storage options including hanging them around vases, on burlap, inside a multi pocket hanger and many more and none of them have been as effective as I would have liked. I have finally found the simplest easiest solution that is working great for me and they are tiny grip seal bags, it was either this or ice cube containers and I knew that would look pretty but wouldn't work. I love having a rummage and this way nothing gets tangled or lost, it's a nice organised type of chaos I can handle. I have stashed them all inside one of the Ikea Alex unit drawers alongside other bits of jewellery and it's working a treat. I really love that unit, it houses EVERYTHING! And hello from me, so last night was date night and it seems I can't whip out my SLR before we leave and opt for phone photos instead, which is why I hardly share date night photos anymore but I seriously need to, maybe that can be my new years resolution. I got the prettiest dress from H&M, I couldn't see it on the website but it's new as I haven't seen it in store before, it was a steal at £24.99. It's fitted at the waist and then has floaty with slightly shorter sides with quite a bit of fabric which is unusual for the high street. I wore it with black tights, block heel boots and a cropped leather jacket with a cream crochet shawl. 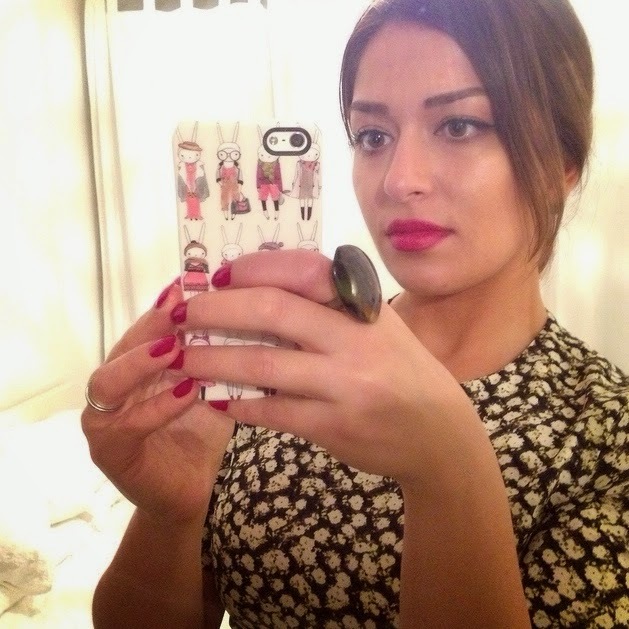 I went for red on the lips using Illamasqua 'Box' and Mac 'Impassioned' lipstick to get the perfect raspberry shade tone to match my Barry M Raspberry nails. I LOVE the 'Mary-Lou' highlighter as you can tell I lathered it on lol, but it's just so pretty! I teamed it with bare eyes with just a little eyeliner, mascara and a low up-do. 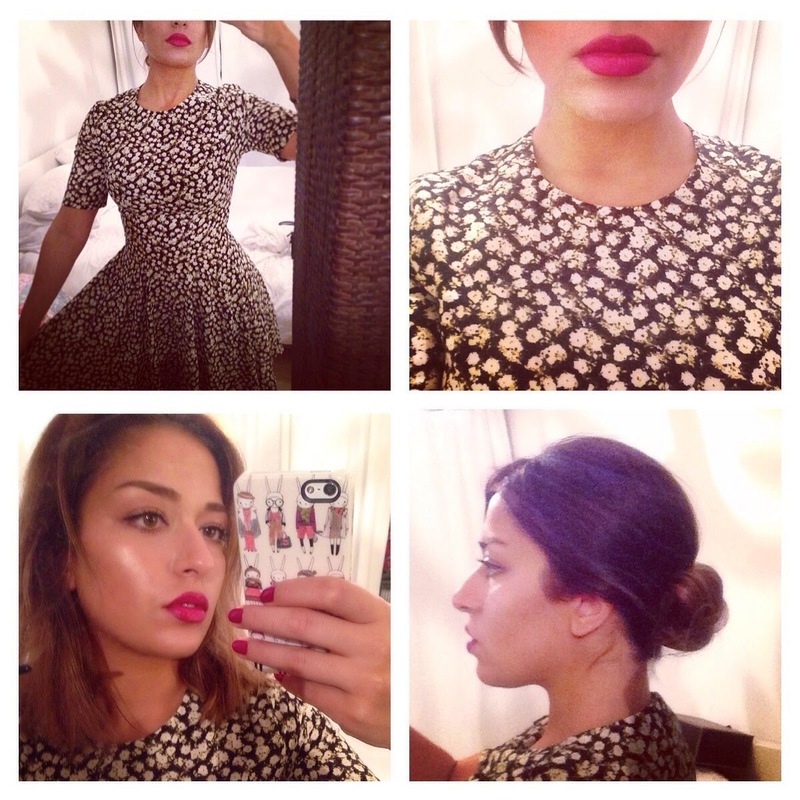 It's a perfect festive date night look and I can't wait to wear the dress again! I've been working on decluttering as well, it's something about this time of year! I love the date night look so much, too. That was such a pretty outfit and make up look. What a great storage idea for earrings! Mine are always all over the place... I love your rabbit phone cover as well - what a whimsical piece!